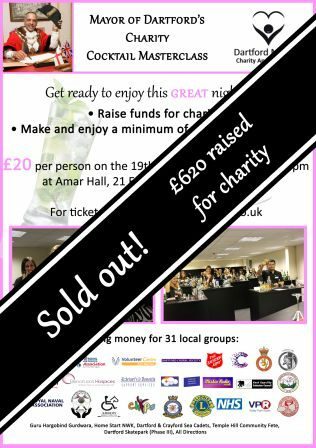 On the 19th September 2014, the Mayor of Dartford Avtar Sandhu MBE will be holding a charity cocktail Charity Cocktail Masterclass Dartford making masterclass at Amar Hall, Dartford in aid of his Charity Appeal to raise funds for his 31 groups, charities and organisations. With a venue able to accommodate a grand number of cocktail enthusiasts, this charity cocktail masterclass is sure to be a hit! On the night, each individual will have a section of bar counter to work behind whilst making and enjoying a minimum of 3 different cocktails. Don't know how to make cocktails? Don't worry - you will be in the safe hands of a professional cocktail bartender who will talk you through and demonstrate how to produce the beverage! The Mayor of Dartford is hoping for a sell out and to raise as much money as possible from the great causes!